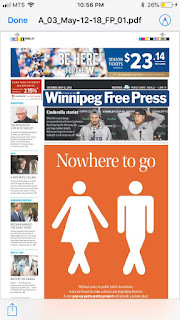 The issue of public washrooms is back in the media with Randy Turner's interesting feature in Saturday's Winnipeg Free Press. 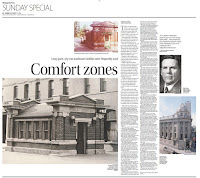 In it, Turner looks at the lack of public washrooms in central Winnipeg, the fact that it was once considered an essential service provided by government, the city's unwillingness to deal with the issue and what other communities have done to provide them. Also, he shows off a demonstration "pop up" public washroom facility that will soon be put into use on a trail basis in the core area. It should be noted that this is NOT a city project, but that of architect Wins Bridgman and the Downtown BIZ. For the city's part, back in 2008 they ordered Bridgman to take down a pair of portable washrooms he rented for Main and Higgins to curb a public defecation problem. In turn itt promised to examine how best to deal with the issue of public washrooms in the area. The motion sending it to administration for study took place in September 2008. A decade later, the study is still not complete. The lack of public washrooms in the city is something I have written about before both on my blog and in my column. It is an issue that I feel strongly about as it is not just a necessary public amenity but also a human dignity issue for people living in poorer areas of the city. One of the more glaring examples to me is Memorial Park across from the Legislature. On a warm summer day it can attract hundreds of people to wade in the fountain, play soccer or just sunbathe. It is the inner city's version of Assiniboine Park. The province removed washrooms that were there more than a decade ago (Memorial Park is a provincial park) and nothing has replaced them. This leaves people that want to change or have to use a washroom to do it adjacent to one of the busiest streets in the city. Hopefully, the latest story will push the issue that nobody wants to talk about onto the public agenda.